Airline Network Planning and Scheduling offers a comprehensive resource that is filled with the industry's best practices that can help to inform decision-modeling and the problem-solving process. Written by two industry experts, the book is designed to be an accessible guide that contains information for addressing complex challenges, problems, and approaches that arise on the job. The chapters begin by addressing the complex topics at a broad, conceptual level before moving on to more detailed modeling in later chapters. This approach follows the standard airline planning process and reflects the duties of the day-to-day job of network/schedule planners. 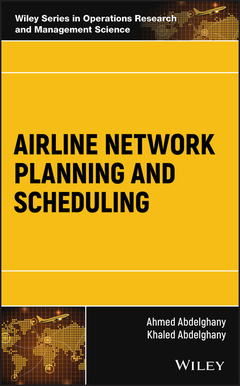 Written for professionals and academics, Airline Network Planning and Scheduling offers a resource for understanding best practices and models as well as the challenges involved with network planning and scheduling. Ahmed Abdelghany, PhD, is Professor in the Department of Management, Marketing, and Operations at Embry-Riddle Aeronautical University. His past experience includes being a senior analyst in the Information Services Division (ISD) at United Airlines. Khaled Abdelghany, PhD, is Professor and former Chair in the Department of Civil and Environmental Engineering at the Southern Methodist University. He has worked as an analyst in the ISD at United Airlines. Disponible chez l'éditeur (délai d'approvisionnement : 12 jours).